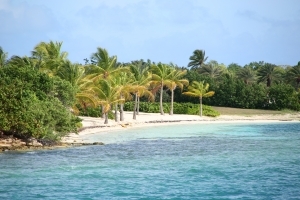 Leeward Islands, Where to Berth Your Superyacht? 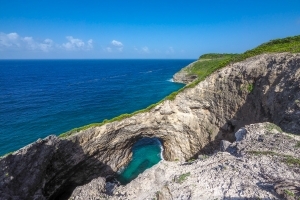 Home > News > Leeward Islands, Where to Berth Your Superyacht? The mooring location for your luxury yacht charter takes prime importance in holidays. When planning itineraries, we offer our clients several berthing options for the vessel and usually it is either in a marina or at buoys. Caribbean Islands abound with breath-taking bays that never fail to offer the most beautiful anchorage spots. After all, considering that 70% of your nights on board will be at anchor, who doesn’t want to wake up in the surroundings of turquoise shimmering water lapping scenic beaches? 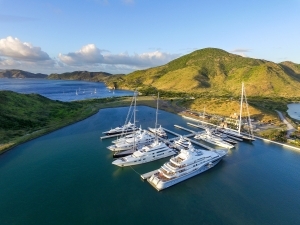 To help plan your next charter adventure, we’ve pulled together five of the most protected and tranquil places for berthing your yacht across the Leeward Islands. Marie Galante is a dependency of Guadeloupe, one of the French islands of the Caribbean. With few inhabitants, Marie Galante doesn’t have a large, fancy resort and retains a very authentic, relaxed vibe. Moor in front of St Louis and jump on the tender to experience an authentic Caribbean night out. As the sun goes down, you can be entertained by the relaxing sounds of live bands taking to the stage at one of the island’s numerous local bars. This is the first of the two anchorages we recommend around Antigua. Jumby Bay is the anchorage spot just off Long Island, a private island hosting Jumby Bay resort, which we have selected as one of our preferred places to eat whilst in the Leeward Islands. See more here. Jumby Bay is a great location for unwinding amid lush Caribbean scenery, whilst sipping rum cocktails on the deck of your yacht. Green Island, situated just off Antigua’s East coast, boasts secluded bays that perfectly define the true meaning of a “getaway”. 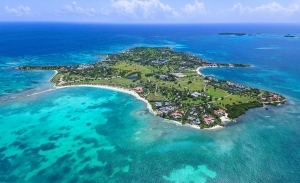 Towards Antigua, the main anchorage is Nonsuch Bay. True to every location in Antigua, beautiful white sand beaches are in every direction, and if you want to head underwater and go snorkelling, there are plenty of unmatched reefs. The windy side of the island, where the scenery is more dramatic, makes for the ideal opportunity for fantastic windsurfing. The island is private and accessible by tender and should you wish to escape the beaches you will also find ashore a great art gallery and local craft shop. 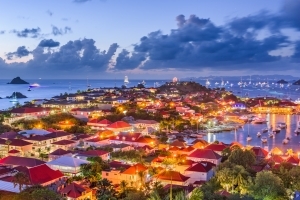 If you fancy pure glamour and blissful yachting, Gustavia Harbor in St Barts Island is the place to be. The location is certainly very exclusive and your Superyacht charter will be surrounded by the largest and most private luxury superyachts in the world. Here you just have to jump off at the quay to shop for high-end luxury brands, indulge in fashionable restaurants (have a look at our selection) and experience glittering nights out. Last but not least, is the brand-new Christophe Harbour on the up-and-coming St Kitts and Nevis islands, which lie in the waters between Antigua and St Marteen. The harbour is naturally protected, whilst designed to cater to everything you need from a luxury yachting voyage with a marina that has its own fitness centre, luxury shop and restaurants. A short stroll from here are other great restaurants from which to taste the localty’s finest cuisine.